David Yau Yau, Governor of Boma state, was instrumental in rescuing three children who were abducted from the Equatoria region in South Sudan, in 2017. With the help of United Nations Mission in South Sudan (UNMISS), the Governor personally accompanied the children to Juba. UNICEF and the South Sudanese authorities will work together to trace the children's families and reunite them with their parents or relatives. 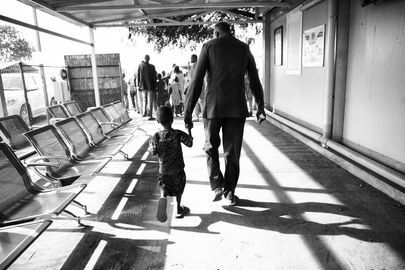 Governor Yau Yau walks with one of the released children in Juba.